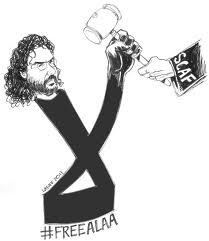 Blogger and activist Alaa, for whom the poem "The Prisoners' Laughter" was written. Egyptian poet Abdel Rahman el-Abnudi, born in 1938, is one of Egypt’s best-known colloquial poets. He has composed a number of popular poems speaking to contemporary events, one of which was the hopeful “Al Midan,” translated here by students of Dr. Samia Mehrez’s “translating the revolution” course. 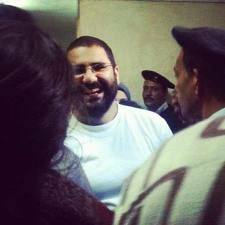 More recently, he composed “The Prisoners’ Laughter,” dedicated to activist and blogger Alaa Abdel Fattah, who has been in military detention since Oct 30. Abdel Fattah missed the birth of his first child earlier this month. and the cell, for your sake, hates the jailer. Come taste with us the sweetness of the prison cell. however hard he tries, will never know you. the sun grieves like every prisoner. its songs of suffering passed down from those who came before. twins, in a moment of passion born. El-Abnudi’s Death on the Asphalt was listed as one of “Africa’s Great Books of the 20th Century” by a panel of judges at the Zimbabwe International Book Fair. However, El-Abnudi’s work — like other colloquial poetry — is very difficult to translate, perhaps on par with how difficult it is to translate slogans and chants. Despite his popularity and significance, I haven’t found any of his poems in any English anthology of Modern Arabic poetry. Do you think it’s because colloquial poetry is harder to translate? There is less “academic” interest, and academics have largely controlled translation? Or…? I don’t think its harder to translate, it just needs the right type of collaboration/consulting. My impression is that academic interest in Abnudi would stem from the very reason why he writes in colloquial (to reach a larger base, increase [political] awareness etc). He is a major portal into Upper Egypt’s culture and the peasant vs. State saga. Another colloquial poet who should be added to anthologies is Ahmed Fouad Negm. I *do* think that there’s something less easily graspable by Western poets in the colloquial/popular vs. the more fos7a work. Sure, it can be done (Khaled Mattawa could do it, surely) but it takes someone who really…understands the difficulties in cultural translation as well as poetical. Hi Marcia – both the videos you linked to are the same: a call-in by Ahmed Fouad Negm in which he raves semi-coherently (his default mode these days) against SCAF and then swears long and hard at anyone ‘who tries to steal the Egyptian revolution.’ Like music to our ears, of course…but, alas, not quite an Abnudi poem. Oops, sorry about that. I think it was right at some point. Somehow I must’ve overwritten with the last thing I was looking at…the Fagoumy call-in. Nope, now I screwed it up entirely. Hmm..